Having all enjoyed our productive visits to Farnborough International Airshow (FIA) last week, despite the inclement weather, it is now time to exclusively share the creative invitation design we provided for TAG Farnborough Airport to use for their corporate hospitality guests. The pictured concept is the latest creative invitation design we have developed in recent years for TAG Farnborough Airport. These have included mini-collapsible binoculars and ‘fantastic’, animated lenticular wind tunnel postcards. The new invitation features a custom designed, fold-up stainless steel cut-out showing an aspirational climbing business jet in plan view. 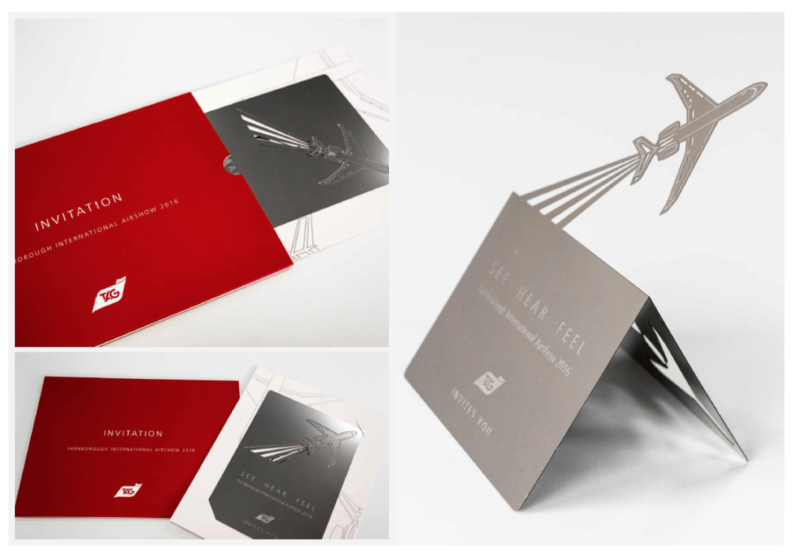 The words ‘SEE, HEAR, FEEL’ inspired by the theme of this year’s public airshow was used on the metal element to complement the tactility of the invitation package which also featured a metallic printed programme and a specially made custom branded slipcase and postal envelope.